Two illegal firearms were taken off the streets on Sunday and so were the men carrying them. 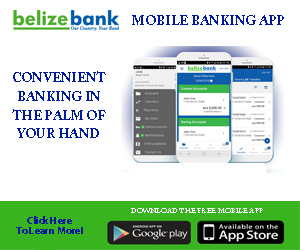 Thirty year Kareem Bennett and twenty-seven year old Chris Reynolds were both remanded to the Belize Central Prison after being charged for separate incidents. Bennett was arraigned in the court of Magistrate Hettie Mae Stuart for Kept Firearm and Ammunition Without a Gun License; he pleaded not guilty to both charges. Police say that on Sunday Bennett was arrested at the corner of Graduate Crescent and Campus Avenue after officers on mobile patrol searched a car in which he was travelling with four other men. Nothing incriminating was found in the vehicle or on Bennett’s companions, but he allegedly had a nine millimeter Smith & Wesson pistol, loaded with six live rounds of ammo in his pants waist. 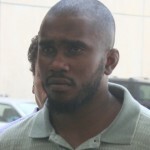 He is to return to court on July twenty-fifth. Meanwhile, Reynolds was taken before Chief Magistrate Ann Marie Smith and was also read charges of Kept Firearm and Ammunition without a Gun License. He was reportedly caught with a nine millimeter pistol and eight live rounds of ammunition, but the details were not discussed in court today. 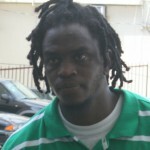 Reynolds also pleaded not guilty to the charges and was remanded to the Belize Central Prison until July twenty-sixth. We have harsh firearms laws — let’s enforce them to the maximum. These people have ruined Belize and no smart person would argue otherwise. keeping unlicensed firearm shoud be the same as attempted murder…..why you want to carry a gun if not for shooting somebody? And “MADDYVANDIJKDEREALISTO” sounds stupid with “sentence:death”. You sound uneducated if you would kill someone for carrying a gun. In that case half the world should be dead. Belize may have harsh firearm laws but what happens when the people enforcing the laws are just as corrupt? What do you do in a town where you have to watch your back from regular psychos with guns and then uniformed psychos with guns? You have to protect yourself……………. In that type of environment I would treat a gun like a condom. I rather have it on me and not need it, than to need it and not have it on me… I know these dudes as well and I hope everything works out for them. Easier said than done Sasha… All I’m saying is it can be me today and you or a love one tomorrow. The ropes in Belize are too tangled to be climbed without having to pay someone under the table. Some people are just trying to protect themselves. I’m just addressing these people who think that everyone up on the news is automatically guilty. It’s innocent until proven guilty and not the other way around. You guys are in too deep!